There are 6 heading elements, named as "h1", "h2", "h3", "h4", "h5", and "h6". Heading elements are mixed content elements. Heading elements can have empty contents. Heading elements can have PCDATA as contents. 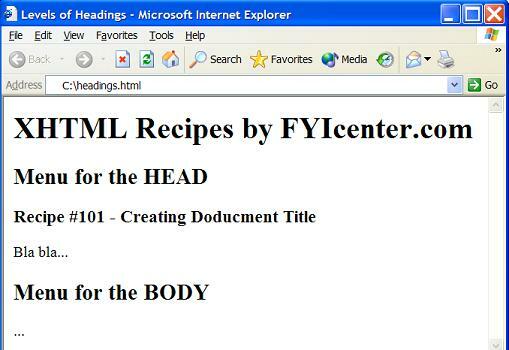 Heading elements can have in-line elements as contents. Heading elements can not have block elements as contents. Heading elements are block elements. They can not be used as in-line elements. Browsers display different heading elements with different font sizes. "h1" element will be displayed with a larger font size, and "h6" with smaller font size.